Love this little silicone fish! Perfect for scrubbing my daughters head with slight bits of cradle cap, and super soft for scrubbing her little body. Plus, she loves playing with it in the bath. This will now be an item i buy for future moms! having a toddler with SPD, this changed bath time completely! We went from screams and tears to giggles and smiles from the first use! HIGHLY recommend to anyone struggling with bath time sensory issues! I honestly can’t say enough good things about this gem of a product!!! I originally bought the pink scrub as an alternative to yucky and ineffective (in terms of sudding) washcloths for my 4 month old daughter! Let me tell you people: Game Changer! She’s 9 months old now, and I’ve never used a wash cloth on her since (major savings on laundry!!) She loves to use it as a fidget in the bath, and I’ve realized it also serves as a toothbrush/teething toy as well, because she loves to chew on it now that she’s teething! So easy to sterilize, and it’s like-new! Guess what, I loved it for her so much that I bought one for myself and my niece (who is in university btw)! We both have never used a loofah since! Makes my skin feel so clean and soft , and my niece absolutely loves hers too!!! Funnily enough, I also bought one to wash my dishes!!!!! Not only does it work superbly, and eliminate nasty J Cloths, but it also looks so darn cute in the kitchen! Wow, I also discovered another use for it recently!!! A smoothing hair brush in the shower!! Now I have EXTREMELY thick, natural hair ladies , and I am able to VERY EFFECTIVELY smooth my hair using the long strands while standing under the shower stream!!! I’ve noticed that when I apply my products, they go on much better, and my curls are smooth, shiny, and pop more!!! I simply can’t live without this little fish gem!!! Thank you Innobaby for making such a wonderful and multidimensional product!!!! What everybody is saying is true: this little fish is great! We've been using ours with every bath for two years and it still looks new. First we use it to scrub with a gentle liquid baby wash and after rinsing, it's just one of the toys. We don't have a ton of room or patience for a million things in the tub so we have just the essentials : two nesting cups (one has a spout, the other has holes), a hedgehog fingernail brush, a bath duck and of course blue fish made the cut! It sinks in water which makes it different from the rest and she's always loved the gentle massage and easy grip. Now she's two and half and she can wash herself with minimal help. It is easy to sanitize and dries completely and quickly for travel. It really is that good. My daughter absolutely loves this scrubber. I love it because it really works and is a good alternative to a wash cloth. My daughter loves it because it's a fun shape and she can do it herself! Would definitely recommend this to others! When I first ordered this I was a little worried. Like how can silicone be nice and soft for a baby?? Totally confused yet intrigued I had to get one. Oh my senses! This thing is so fun to play with outside of the tub I can only imagine how it is inside the tub. We used it for the first time tonight with my 3 year old. I was a little concerned how I would hold onto it. It was AMAZING! Literally awesome for bath time. Would totally recommend this product to all my mommy friends. I used this on my 2 month old during her bath and just loved it. She seemed to be in a little trance when I would stroke her arms or legs with it! She absolutely loves it and it's so much easier to clean than the washcloths and loofah's that I have used in the past! All my kids have one now! I recently purchased as an alternative scrubber for my daughter in the bath. Well just last night, she decided to give herself "tattoos" ALL over her body. Used the scrubber and every last mark came off! I could be gentle while still scrubbing, she even loved getting scrubbed down because it didn't hurt like a washcloth would have! Needless to say, we love this product! My baby loves this. After I bathe her she loves to play with it and try to wash herself. I will be buying more of these to have on hand. I love this scrubby fish! Our four month old still has cradle cap, so I usually use a soft baby brush on his scalp when we bathe him. Then, I switch to a wash cloth to bathe the rest of his body, but I hate having both the brush and the wash cloth hanging out to dry because it takes forever. I also worry about any little debris getting stuck in the bristles of the brush and not getting fully clean. 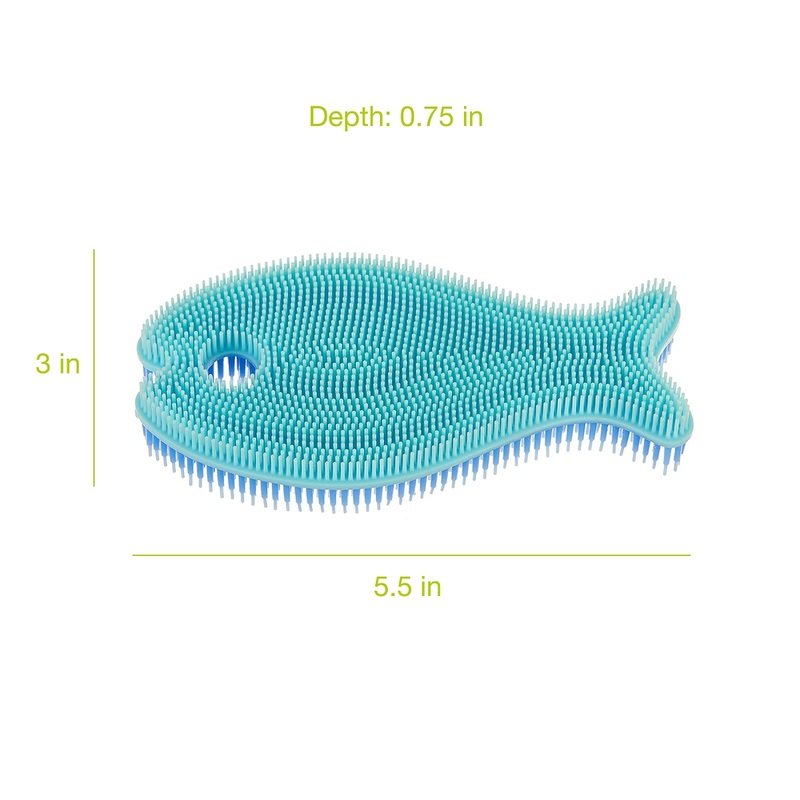 That's where this scrubby fish has become our bathtime hero! Baby loves to play with it while we enjoy the water as it fills the tub. It's so soft and floppy that it can't hurt him when he slams it into his face to explore it with his gums and mouth. When it's time to wash- it's perfect for little suds and helping to break through the cradle cap. It's more effective and more gentle than the wash cloth - and it doesn't take forever to dry. Click the button below to add the Innobaby Bathin' Smart Silicone Fish Antimicrobial Bath Scrub for Babies and Toddlers to your wish list.